When Evelyn Moore was just four months old, doctors discovered a lump protruding from her spine and diagnosed her with a kind of cancer called neuroblastoma. Eveyn's tumor paralyzed her from the waist down, and although the little girl from Edmonton, Alberta Canada was still just a toddler, she had to endure eight rounds of chemotherapy. 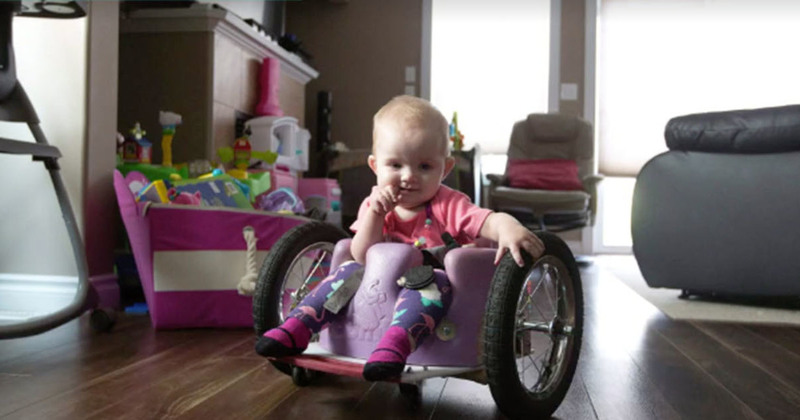 In an effort make life a little easier for Evelyn, her parents decided to buy a special wheelchair for their daughter. But when they saw the price tag, they realized they couldn't afford one. Then Evelyn's father, Brad, got an idea. He decided to build his little girl a DIY wheelchair. 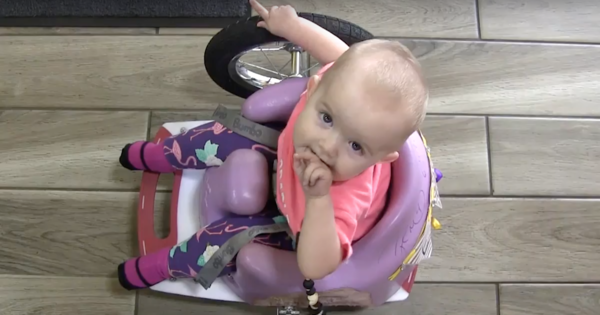 Using a Bumbo seat, a cutting board, a two wheels from a kid's bike, Evelyn's dad managed to build a pretty great wheelchair for just $100! And Evelyn seems to love it. Brad made sure it fit Evelyn perfectly, and now shes goes wherever she wants at home! In the United States, 650 to 700 children per year are diagnosed with neuroblastoma. It is the most common cancer among infants, and unfortunately, the mortality rate is high. Please share the story of this clever, caring dad with your friends!